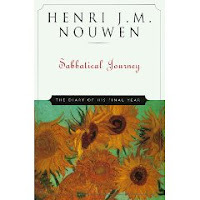 While Tom and I were on vacation, I finished reading Henri Nouwen’s posthumously-written book, Sabbatical Journey: The Diary of his Final Year. I very much enjoy his writing so it was a pleasure to see closer inside the man. One thing that surprised me was the amount of travelling he did in the span of one year and I wonder how he afforded it. I thought Catholic priests took vows of poverty. Did the church pay for his trips? Was he allowed to keep the income from his writing and he used that? He was constantly flying—twice to Holland, several times back to Toronto where his Daybreak community was, across the continent to visit a friend, to another state to marry friends, trips to speak with his editors, publisher and people who had the wherewithal to give him guidance in one form or another. I don’t agree with all his theology. Several times he mentions praying to a particular saint, for example, and even to a recently deceased friend, and that bothers me, but I choose to focus on what we believe in common. He had a habit of celebrating the Eucharist every single day. During the year of this journal, he was staying in various places that offered him seclusion and silence and yet, when possible, he chose to celebrate the Eucharist with others. It was more than simply taking the bread and wine. It seems there are specific Bible passages to read for each day—probably one from the Old Testament, one from the Psalms, one from the Gospels and one from the Epistles—so these would be read aloud with the group and often he had a homily, though my guess is that it was usually unprepared. At times, there were fifty people gathering for these mini-services in a garage, a home, a barn, and the people developed community with each other in a way they hadn’t before. I wonder if they continued to meet once Nouwen had moved on. He had a number of book projects on the go at once. He was translating one of his books into his mother tongue of Dutch; preparing to write about the Rodleigh family of trapeze artists; about Adam, the disabled man at L’arche Daybreak for whom he cared, the journal of his time in Winnipeg and a book called Can You Drink this Cup? The Winnipeg journal in particular intrigued me—partly because Winnipeg is my home and partly because of the reason for the journal and why he was in Winnipeg. He had developed a close and dependent relationship with a friend he had met in France who became part of his Daybreak community. Most unexpectedly, seven years previously, the friend cut off all interaction, effectively ending the friendship, which caused Nouwen to spiral down in pain and depression to the point that he could not function and had to leave Daybreak for six months. It was a time of emotional fragility and spiritual therapy. I wonder why he chose Winnipeg. I wonder if the journal was ever edited and published. This part of his story is so like part of mine that I want to know more about it. What captures my attention is that Nouwen was a world-renown scholar and writer, former professor of Yale—a university of no mean reputation. If he, a priest and scholar, fell into an emotional dependency then I am not alone. Nor am I less of a person because of it. I can see that for Nouwen. Why is it so hard to see about myself? What are the most important parts of my life? This last is a scary thought and yet so true. God grant me the daring to be vulnerable!